We have written songs with and about the people of St Madoes and their stories, using the interviews we did in St Madoes, Chapelhill and Hawkstane. We have made songs about the people of Abernethy and their stories, drawing on the recordings made by Abernethy Museum. Some are created with the children of Abernethy Primary. 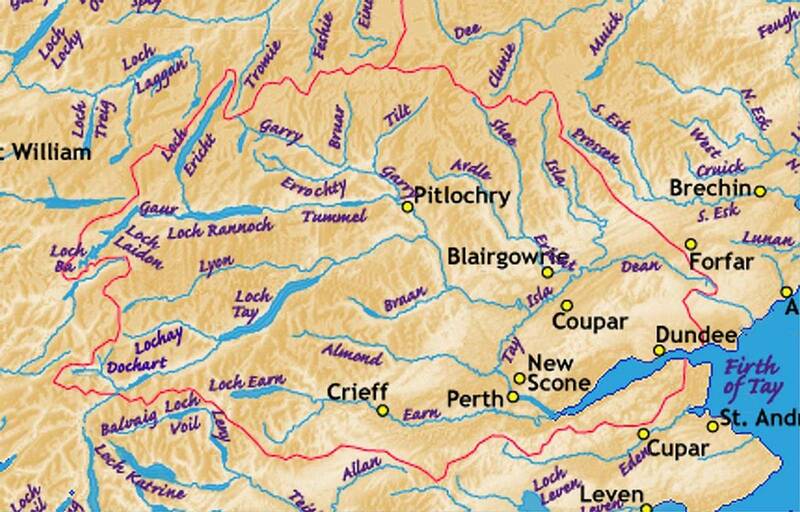 We have talked with older people in other places around the Tay Landscape area to learn more about the life and the people, and put their stories and information into songs. 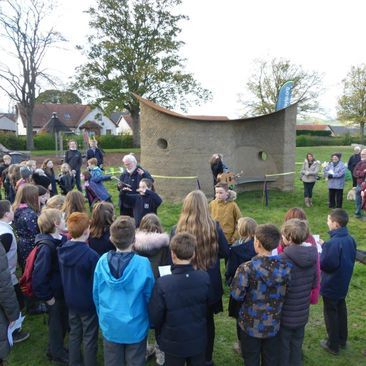 We have written songs about the clay buildings of Errol and the people who are working to restore them. We have created a joint project with Piece Partners of Perth, a group of quilters. They made small quilts and we made song verses to accompany their images. The joint work will be on exhibtion. We hope you enjoy these songs! Learn about Ceilidhmakers at http://ceilidhmakers.co.uk/. For more information please contact Christine Kydd at scotsvoice@christinekydd.com. Christine is one of Scotland's best-known singers, an experienced practitioner and curator of educational projects. She graduated in 1991 with an ADVS in Voice Studies from RCSSD in London and in 2014 with a Masters (Ethnology and Folklore) Elphinstone Institute, University of Aberdeen. She sits on the board of the Traditional Music Forum. Ewan has written several books on aspects of traditional Scots song, and is one of Scotland’s best-known storytellers. He has created several resource websites and projects around Scotland and in Africa and Russia, including Songmaker in Schools, and The Great Scots Song Treasure Hunt. In 2015 he was given the Hamish Henderson Award for Services to Scottish Traditional Music. 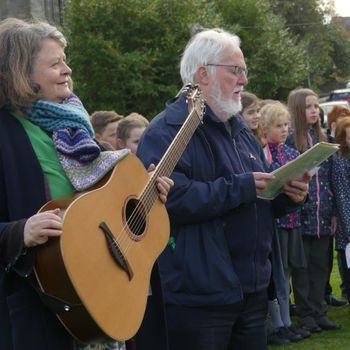 In 2010 Christine and Ewan wrote songs with the six primary schools in the Carse of Gowrie. See the lyrics here. 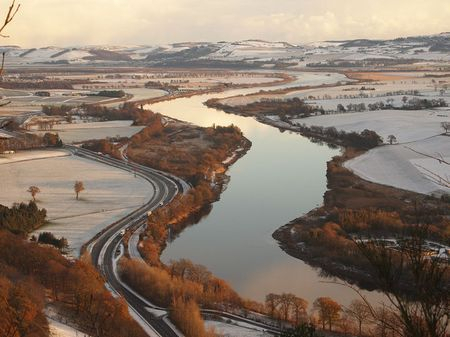 Ceilidhmakers are working throughout 2017 with Tay Landscape Partnership to celebrate the life and history of communities around the Firth of Tay, making new songs out of the stories told to them by Tayside people. In the Telling Our Stories Project Ceilidhmakers are working in St Madoes, Abernethy, Perth and Errol, making songs that will share unique aspects of each place, and some that range more widely along the Tay, like a song to celebrate the many ferries that used to cross the Tay, and the one remaining ferry that runs on demand about once a year, and was once used by kings on their way to be crowned at Scone. The new church and community centre in St Madoes is due for a grand opening soon, and Ceilidhmakers will share songs they have made from stories of their communities gathered from older and newer St Madoes people. Five songs tell of how St Madoes was built, and the people who worked on the land, farmed or harvested tatties, or made bricks from the clay. The tales include a horse taken into visit a sick woman's bedroom, summer visitors, beasts growing fat grazing on Mugdrum Island, and a seahorse collected on a wheelbarrow by schoolchildren. The primary schoolchildren of Abernethy will write songs with Ceilidhmakers based on the many hours of interviews about the people of the town and the land recorded by the volunteers of Abernethy Museum. The clay-built buildings of Errol and Cottown will be sung about. Christine is singing and talking with groups of older residents in several places, gathering more tales. A chance encounter with the Perth-based quilters group Piece Partners has resulted in an exciting collaboration of visual art and song. The quilters are working from visual images from the past of the Tay researched by Ceilidhmakers to make baby-sized quilts, Ceilidhmakers will then write song verses to accompany each quilt.